Frampton Comes Alive, a live album by Peter Frampton recorded in 1975 and released the following year to become the best selling album of 1976. I have to confess to being mystified by its success. I didn’t get it when some of the other kids at school were raving about it in 1976 and I still didn’t get it when I finally bought it a couple of years ago when I realised I was going to base my album collection on live recordings. It’s one of those albums that so many people like that makes me think I must be wrong. A 25th Anniversary edition was issued in 2001 which added four extra songs and changed the order of play. I will be writing a full review on this album but my impressions aren’t good. I don’t understand why so many people love this album. Videos of Peter Frampton performing live in 1976. This is one of the best selling live albums ever and one of the most revered. It’s also very popular at Amazon. 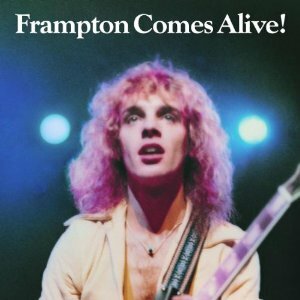 What Do You Think About Frampton Comes Alive? Do you think this album has deserved all the success it has received or is it over-rated? Is it even the best live album by Peter Frampton? Lovers of Humble Pie will probably argue that eh peaked with Performance: Rockin’ The Fillmore. This entry was posted in 1970s Live Albums, Classic Rock Live Albums and tagged 1970s classic rock, 1975 live albums, classic rock 1975, Peter Frampton Live Albums by Paul Simister. Bookmark the permalink.